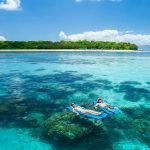 If you want to make the most of your time exploring the Great Barrier Reef, snorkelliveaboard trips are the perfect option. You’ll eat and sleep right on the water aboard a luxury vessel. You’ll have everything you need right on board, so there’s no need to head back to shore. With a number of liveaboard snorkel tours available, you’ll visit the best snorkeling locations, visiting multiple sites during your snorkel trip. On our liveaboard snorkel tours, Reef Encounter you’ll explore coral lagoons and beautiful coral gardens while you swim with a diversity of marine life. It doesn’t matter your level of swimming, as the guided snorkel tours are perfect for everyone, despite skill level. As long as you’re able to swim, you’re able to snorkel. When you choose liveaboard snorkel tours everything you need is right onboard, including equipment. When you’re not exploring the vast Great Barrier Reef, you can head onboard the vessel to eat, sleep, sunbathe on deck or relax in the lounge area. Snorkel liveaboard tours cover everything to ensure you have the best time possible, including monitoring water conditions. Each snorkel location is evaluated daily for diving conditions, so you’ll only snorkel the best locations with ideal visibility. With calm waters and maximum visibility, you’ll have an unforgettable experience exploring the hard and soft coral gardens as you swim with an abundance of marine life. You’ll swim with thousands of fish– both large and small. You’re also likely to see giant turtles, clams, and maybe even a whale, dolphin or white tip reef shark. As you visit each location during your liveaboard snorkel trip, you’ll have a new underwater experience each and every time as no two locations are the same. While you find adventure in the world renowned snorkeling locations, you’ll have a number of days to stay on the reef as tour packages vary. The affordable tour packages offer you many options, including family snorkeling trips and VIP tours. If you prefer to only spend a day snorkeling, there are even day tours. Reef Encounter liveaboard snorkel tours offer flexible itineraries you can join the tour on the day that suits you best and stay for as long as you like and are affordable on just about any budget. No matter how long you spend exploring the Great Barrier Reef, snorkeling the reef is a one of a kind experience that won’t be matched anywhere else in the world. Plan your liveaboard snorkel trip today!